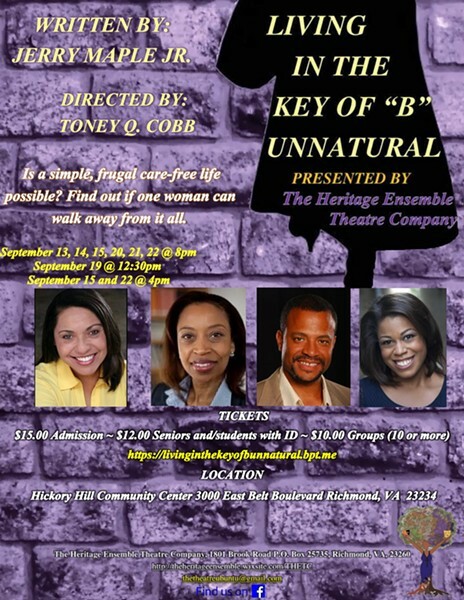 Living in the Key of 'B' Unnatural Written by Jerry Maple Jr. | Hickory Hill Community Center | Stage | Style Weekly - Richmond, VA local news, arts, and events. Living in the Key of 'B' Unnatural Written by Jerry Maple Jr. Living in the Key of 'B' Unnatural is a lighthearted Serio-comedy about a woman's attempt to live a simplistic and frugal life after running away from her past. We yearn to understand how her experiences could cause her to dismiss her family and friends, vowing never to return. Will she be able to avoid all of life's responsibilities by just turning her back? Or will her past force her to face it head on?